Easy sauerkraut recipes can be made with different types of cabbage, many other vegetables, and salt. And it's also possible to make a salt free sauerkraut recipe. One of the main health benefits of sauerkraut is its ability to maintain our intestinal flora which aids in the digestion of cooked foods. 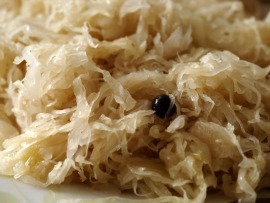 Sauerkraut is a type of probiotic vegetable that has been consumed for thousands of years. Unfortunately, most of the sauerkraut that you buy at "regular" grocery stores has been pasteurized and will not contain any beneficial bacteria or probiotics. Luckily, it's much cheaper and healthier to learn how to make your own homemade sauerkraut. You can also incorporate many different herbs and spices into an easy sauerkraut recipes to liven up the taste of this lactic acid ferment. You should also use organic produce and control the amount of salt in your sauerkraut recipes. Massage the cabbage with salt to release its liquid. Then press salted cabbage into an appropriately sized glass jar until liquid rises above the chopped cabbage. Place cabbage core on top making sure chopped cabbage is completely submerged - then close lid. Leave jar out of sunlight at the appropriate temperature for 3 to 5 days or until properly fermented. Be sure to release built up "gas" pressure as needed and put a plate underneath your ferments to catch any overflow. This sauerkraut recipe will keep in your refrigerator for several weeks. Massage shredded cabbage until softened and juices are released. Press the massaged cabbage firmly into 1 or 2 glass jars until almost full (leave at least 1 inch space on top). Then cover cabbage with enough spring water or coconut water to completely cover the shredded cabbage. Place a tea sieve on top of the jar (to keep the cabbage submerged during the fermentation process). Screw on a mason ring to secure the tea sieve and ferment for 3 to 5 days - or until desired ferment is reached. Be sure to leave sauerkraut out of the sunlight and away from dust - and regularly check the water level. A dark kitchen cabinet may be the perfect place to ferment your salt free sauerkraut. Store this easy sauerkraut recipe in your refrigerator and it should keep for at least a month. Add shredded and other prepped vegetables into a big mixing bowl. Next add in the fresh squeezed lemon juice. Then add in your chosen seasoning. Massage the vegetables with your hands until softened. Add softened vegetables and their juices into a glass jar - pressing firmly to release as much liquid as possible. Fill the glass jar until almost full leaving at least 1 inch of space from the top. Be sure the vegetables are submerged in enough of their own liquid or juices to completely cover them. 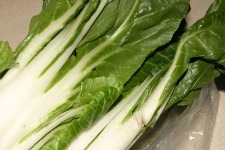 Then put clean outer cabbage leaves on top of the submerged vegetables to seal off any air. Next add a heavy crystal or clean rock to weigh down the cabbage leaves. Finally, cap the jar and ferment in a dark cabinet or closet for 5 to 7 days (at room temperature). Be sure to unscrew the cap every day or so to release built-up "gas" pressure. As you can see there are many ways to make easy sauerkraut recipes. You can add in your favorite spices, vegetables, and herbs to create your own sauerkraut recipes. I especially love the salt free options, as I do not really care for salty ferments. Too much salt aka "sodium chloride" creates hypertension in my body. And I like to taste the vegetables and other ingredients that go into my sauerkraut recipes - too much salt can be overpowering. I also prefer to use celery juice to make a "salt free" sauerkraut recipe along with a little whey (from yogurt) to culture my "salt free" ferments. As an added bonus, celery juice that contains beneficial sodium and whey that contains probiotics will extend the shelf life of your sauerkraut recipes when stored in the refrigerator.